Thanks, Teri. A nice escape for me. I enjoy your drawings. I agree the news is very redundant and just makes me angry. Life is too short for all this “Middle School”(where I worked for 25 yrs) Drama. Take me to my happy place and block out all else. Have a wonderful day. Bunnies always look so sweet until they get into your garden….I hope you will be able to enjoy your new rabbit friend for several seasons. Love your sketch. Lucky bunny! You are right, the world needs beauty versus craziness and bad news. yes! forget about all those people that are in the news determined to make us look stupid….lol I prefer God’s nature, the river, birds and mediation, prayer…..yep…….my guns of defense! Love your bunny, the eyes are so sweet and sensitive….can’t wait to see what you will be doing next. I saw your post from yesterday but got pulled away. Thank you, Margaret. I knew you’d understand. I really need to unplug and take a break from the circus. I just … feel sad when I hear such ignorance and … I won’t say anymore about it. I need to break away and definitely Bunny More and News Less. lol ❤ Glad you like my little bunny. I will be hanging out in nature as the heat allows, sketching, reading, relaxing this week. I really need it. My anxiety level was getting much too high. Thanks again. avoid that news like the plague and enjoy your relaxation 🙂 I do understand, take for example…. Fox news is not even watched in our house anymore because I took a stand and my husband is quite happy without it….thank goodness! yep….I hate Fox news 🙂 yes! sanity is my goal and news free…. Thanks, Jill. I may keep blogging, who knows, but need to unplug from the news. Does art help you escape the news madness too? Oh yes, he is adorable Laura, you have got it right on the twitchy nose…..I can’t say ‘nailed it ‘to a bunny, they are just too cute…but you know I love them….I do hope you catch your visiting bunny, for his sake, do you know of anyone with a humane trap? Thank you so much for the links ❤️❤️❤️❤️…too poorly last night to paint, so no donkey appeared, maybe tonight if my back stops hurting and I can sit down?? Ahhh bless him, so pleased he is looking well 😀 be great to see a photo when you can get close enough. Thanks, we will do it! My husband thinks he can get one. They kinda have a relationship lol. He should’ve been a vet; he’s great with animals. Thank you, Steven, and boy…..keep writing and sharing, just loving what you’re doing, guy! You’re very kind and thank you, friend! Very welcome. A little color goes a long way. Beautiful bunny and good thoughTs on news and peaceful activities. Ironically I’ve written tomorrow’s post about the peace I’ve found in wc art. And I can’t wait to share my bird ! I always love your drawings, Laura – what a ridiculously cute little bunny! I want one! And how sweet that you’ve a new friend, too. Your plan sounds like a wise one. Enjoy the break! Thank you, Jacob. I will, and I am so glad you like my little bunny.. They are just so sweet. Thank you, Jean! He is the sweetest little thing. Loves to sleep in the garden. Minimal use of lines yet a truly lifelike image of a hare that just ran through ling dewy grass. Great art Laura. go bunny go! yay bunny for escaping. Oh hello there fluffy bunny beautiful! ❤ 🙂 Would you like to take a walk with me? Thank you. I hope to get a photo of our wild one, he is so sweet Carrie! Glad you enjoyed this. Love this!! yay to your faces! Always a treat!… The eyes!! So beautifully done and full of live! Only accidentally once when I got the wrong ink for my Lamy pens early on!! 😊Lol It was fun though! You are doing splendid! I look forward to seeing your journey as you continue to draw them. Will you draw bunnies too? Where do you find your models? Hi, thanks BB. 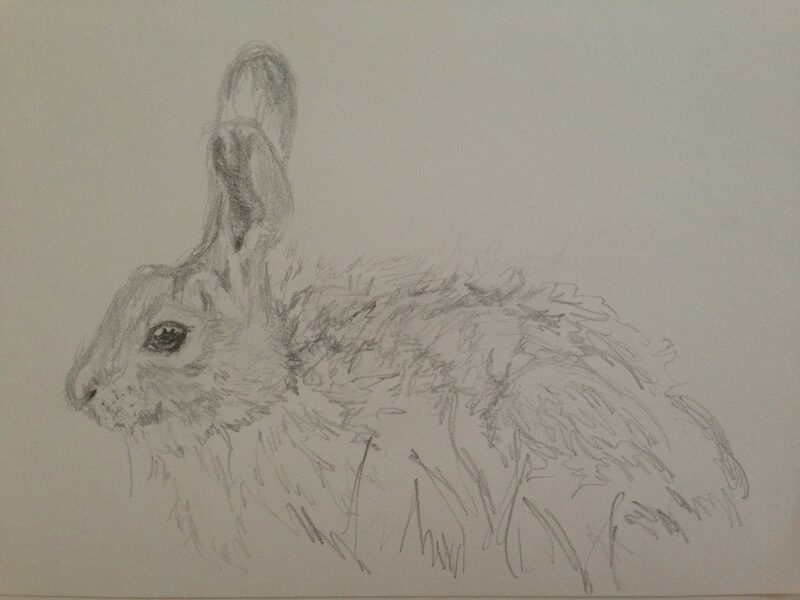 Mostly I get them from the net but when I can get close enough to our bunny I try to quickly sketch him. I don’t get nearly close enough to get any details but it does help to have a live model somewhere close. There is another one of those georgeous life like eyes. I know and you make it look so easy. Thanks for saying so. I’m a long way, but making the journey 🙂 Not so much lately tho, bit of a dry spell and praying for an early autumn. I’ve been thinking about you Dawn, when’s your festival?? How are you coming along with preparations? Been absent for a while and slowly making my way back. What a lovely graphite bunny, awesome ears with minimal strokes. Thanks Mary, I’m absent too! Glad you enjoyed the bunny. I just love them.